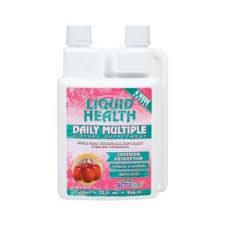 Liquid Health Daily Multiple is an amazing blend of whole foods designed to provide the vitamins, minerals, trace minerals, and amino acids your body needs. The base of pure aloe vera juice is loaded with digestive enzymes, and eleuthero packs an energetic punch. Sea vegetables—dubbed nature's perfect food—provide most of the nutrients in this well-rounded formula. Our aloe vera juice is cold-pressed, leaving the nutrients intact and the enzymes active. Because Daily Multiple contains whole foods and is in liquid form, there are few products with a higher absorption rate. If you have had supplements disagree with your system before, you may find the whole food quality of Daily Multiple to be what you need. Intended for use by anyone who needs a good multivitamin. Taking a good quality multi-vitamin & Mineral supplement like Liquid Health Daily Multiple, can really bridge the gap in nutritional deficiencies.